Unmasking the spirit of pride…. Being as God resists the proud, and gives grace to the humble, and that the sin of pride, is what got satan thrown out of heaven, pride is something that we all must understand, and overcome, in order to live victorious lives of servant hood in Christ. More and more, I am convinced that pride is simply, having a better idea than God on any particular subject. As I look at contentions, and world wars, each of them are rooted in pride. No two people, walking in the love of God, listening to His voice, should ever need to be fighting each other. Every divorce, war, business separation, heartbreak, is rooted in pride, or ignorance. Last Sunday, at Sunday school, (We are taking the Growing Kids God’s Way course, http://www.gfi.org/ where Robert and Rebecca Shaeffer are leading here at Victory Christian center) I heard a lesson on parenting, describing the perils of giving our children too many choices. That, if we were not careful, children would use choice, as an excuse for disobedience. The truth is, so do we. The Ezzo’s gave an example, that really sticks with me. A child was over at a friend’s house, and while they were playing, got wet. So, without asking she went in to the guests home, took a shower, and borrowed some dry clothes from her girlfriend, then marched into the kitchen, opened the refrigerator and proceeded to help herself to something to eat. Now, all of that might have been okay in her house, but to do all of that in a friend’s house, without permission, is a stretch, don’t you think? Let’s take the friend example apart a bit. I believe that God has created good works for us to do: Eph 2:10 For we are his workmanship, created in Christ Jesus unto good works, which God hath before ordained that we should walk in them. I also believe that the earth is the Lords, and the fulness therof. Can we become content with that portion that God gives us of the earth, or do we constantly covet more, and more? Do we take things that legitimately belong to others, ‘assuming’ that it is okay with God? When we do, we become ‘wise in our own eyes’. The earth is full of selfish, grasping people, whose decision making is often contrary to the Word and will of God. God is a good God, who loves us dearly, and who wants only good things for us. Yet, He wants to give them to us, His way, in His timing. He will never be moved by desperation, or a screaming fit before Him, but when we ask Him in faith, then ask Him how to accomplish what we have asked for, He will do it! I read this quote by David Wilkerson, and it struck me: To understand this message, I want to give you new definitions of pride and humility. Pride is independence – humility is dependence. Pride is an unwillingness to wait for God to act in His own time and in His own way. Pride rushes in to take matters into its own hands. One of the greatest temptations true Christians face is getting ahead of God. It is acting without a clear mandate from God. It is taking things into our own hands when it appears that God is not working fast enough. It is impatience..
Saul couldn’t wait to offer up the sacrifice. It cost him the kingdom. David did wait, and little by little, God prepared and established him in his anointing and office, to become a man after God’s own heart. Our promotion is not about us, anyway, but the people we are called to reach, to serve. Godly leaders will recognize pride. Usually this third point is worded like this, “Godly leaders are humble”. For me this is just another slogan that doesn’t deal with one of the most pervasive problems in ministry, pride. Pride left unchecked or unnoticed will destroy leadership and influence, not to mention dishonoring the transforming work of the Gospel. The dictionary defines pride as: the quality of having an excessively high opinion of oneself or one’s importance. 1. Your sentences start with “I” or are surrounded around you. 2. You get convicted/mad when someone tries to correct/instruct you. 3. You have a critical and judgmental spirit. 4. Your closed to accountability. 5. Your getting mad right now as you read this. I believe the hardest thing for a pastor to do, is to be self aware of pride. 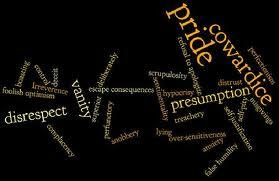 From my own testimony to others I know, we are most oblivious to the sin of pride. So how do we demonstrate the transforming power of the Gospel and cultivate the characteristic of humility in our lives and leadership? 1. Establish a morning prayer and Bible reading time, first thing in the morning, before everything. 2. As you pray, and read the Word, keep a pen and paper with you. God will speak, and as He does, He expects you to do what He says. I write it down, because, in the business of the day, I have been known to forget. Going back to my journal throughout the day, helps keep me on track. 4. I constantly monitor what words I am speaking. If at any point, what I am speaking, is not coming to pass, or I am not doing what I say, then I have moved ahead of God, and am moving in my own strength, not His. I am determined to be wholly Spirit led… I have always been sincere, in my pursuit of God and His calling upon my life, but as I have made decisions that proved to be wrong, I have also been sincerely wrong sometimes. When I am wrong, I fess up, where I mess up, laugh at myself, fix whatever is fixable, and then roll the care of the rest upon the Lord, and move on. 5. Love is the goal, the requirement. How am I treating my wife, my children, street people, sales people, and abrasive folks? Am I good news, and an ambassador of Jesus, or equally as abrasive? How am I treating people? The wonderful thing about the kingdom of God, is that we are part of the Body of Christ, and we are loved. This teaching is not designed to be complete, simply a reality check. I would love to hear your thoughts on this, what is Holy Spirit showing You?